PUPPETEER PROVES DISAPPIONTING I was browsing the ads stapled on the outside wall of a Williamsburg coffee shop when he interrupted me. He was a slight, ragged fellow. Yet, despite his raggedness, there was something deceptively manicured about his appearance. His hair was fashioned in early Bob Dylan style and the beard on his chin was exquisitely groomed to look ungroomed. “Excuse me,” he said politely. But, evidently, it was not he who spoke. 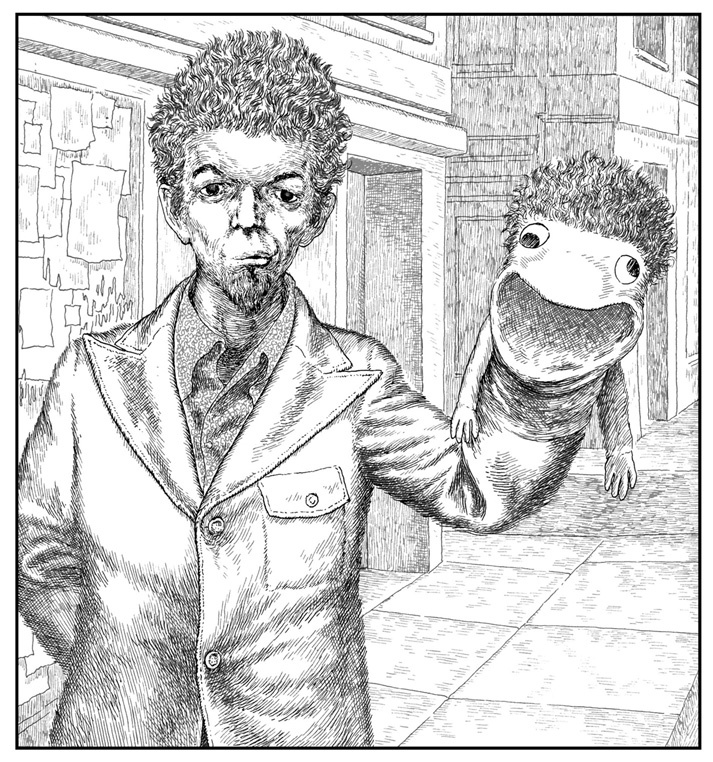 From his gesture, he would have me believe that it was the puppet he wore on his hand – a sock, really; crudely detailed to look like some kind of anthropomorphic creature. The ragged man attempted to throw his voice like a ventriloquist, working the mouth of the puppet with his fingers. There was something of the Elizabethan bard to the puppeteer; a clever street performer who came from a venerable line of clever street performers. “What’s your friend’s name?” I asked the puppet. I dug into my pockets and handed the man what I found. “Does your friend do anything?” I asked the puppet. Then, after bowing grandly, he went on his way, leaving me with the feeling that I’d been cheated out of my money.